In this follow-up lesson to Blues for Beginners: Chord I, we’ll take a look at a few more chord shapes and apply them to the 12 Bar Blues as we did with the first 3 chords. In the first lesson, we learned 3 chords that only required the use of 2 or 3 fingers at a time. The next 2 chords are a little more challenging since more fingers are involved, and the stretch across the strings is greater. If you struggle with these chords, try some of the practice tips. 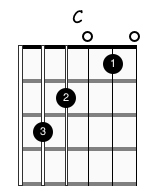 However, if you’re comfortable with these chords already, go ahead and scroll to the 12 Bar Blues section. For the C7 chord, if at first it feels too difficult to coordinate all 4 fingers, use the C major chord instead (shown below). Though it won’t sound as bluesy, it’ll still work for our purposes, and it helps to be familiar with the C major chord either way. Add the pinky back later, once you’re ready. Practice transitioning between C7 (or C) and G. If needed, break up the chords by practicing the movement of your 1st finger separate from practicing the movement of your other fingers since they’ll move in opposing directions. Repeat the following exercises as many times as you need. a. Practice moving the 1st finger across the treble strings. b. Practice the movement of fingers 2, 3, and 4 across the lower strings. 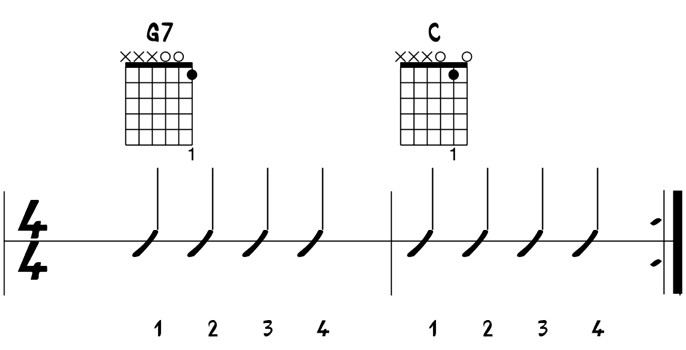 c. Now practice moving between both of the full chord shapes. We will also need the D7 from the previous lesson to play the progression at the end, so practice transitioning to and from the D7 with the new chords. Bonus Tip: When changing between C7 and D7, keep the 1st finger down. 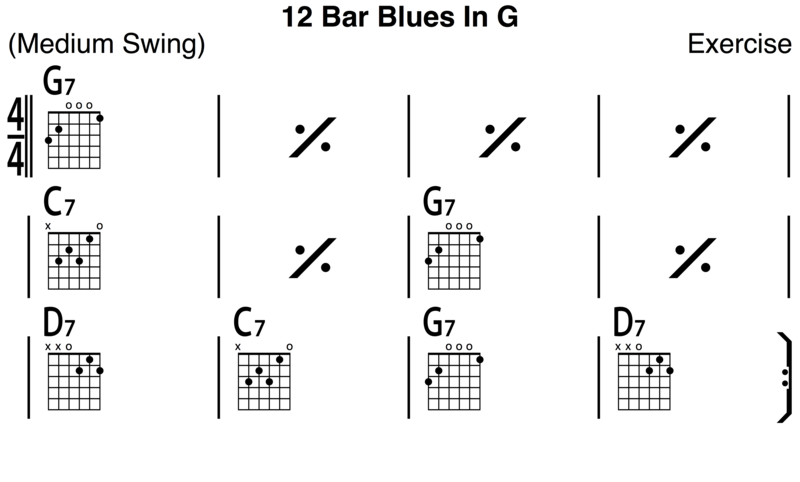 In the last Blues lesson, we played the 12 Bar Blues progression in the key of A. 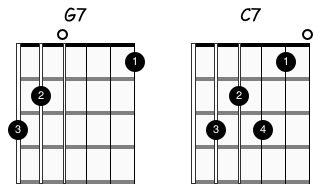 Here, that same progression is shown in the key of G. The progressions are similar because the C7 and D7 chords have the same relationship with the key of G as D7 and E7 have with the key of A.